"My holiness shines bright and clear today." Orchids are beautiful exquisite flowers. They appear fragile and in need of high maintenance but the Angel of Education, my angel card for today, was about to teach me a lesson from nature. 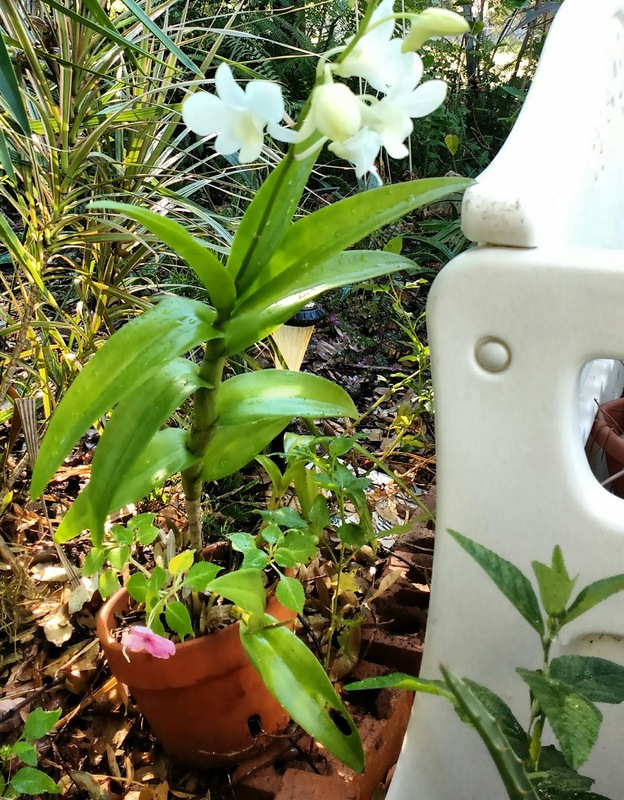 Many months ago when my orchid had shared her final bloom, I tucked her underneath a yucca behind the garden bench. I decided to just let it be, hoping she would bloom again...sometime. This morning while watering the garden, my heart leapt when I caught sight of a tall white flowering plant peeking over the garden bench! At first glance, I thought the white petals were from an ornamental ginger from Virginia Beach. But when I reached down and saw the pot, I smiled at the resurrection energy. My old hardy orchid had grown a new thick stalk to rise to the light and bloom. It was the tallest orchid I had seen. My thoughts turned to the recent high winds during the hurricane, and I was amazed by her endurance having weathered so well in the storm. With God all things are possible. As I studied her white gentle blossoms, an angel message came regarding our own relationships with people and things. When we let go of the need to control the outcome, Providence will take care of the results. Things bloom on time in amazing ways! And the pink volunteer impatiens seeded by the wind in the same pot bloomed in a flowering testimony. Patience has its own reward. Trust.